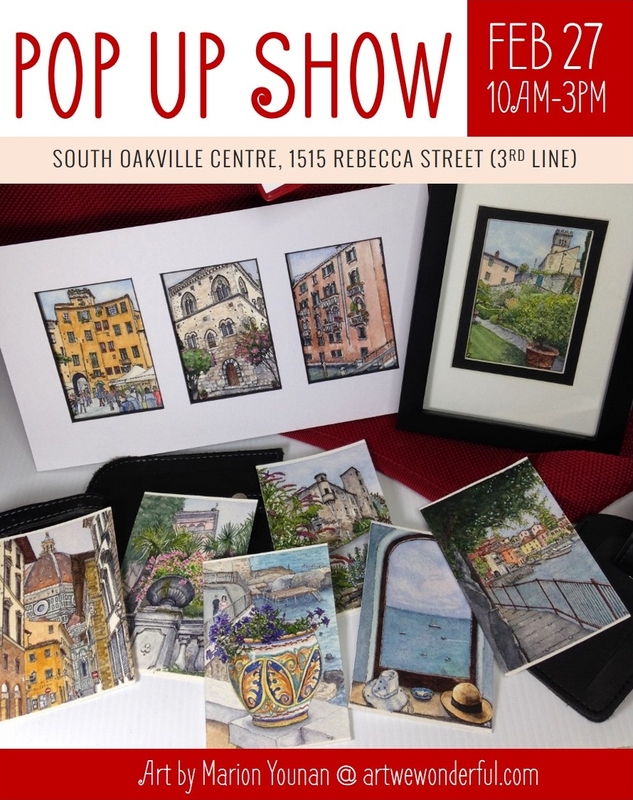 On February 27, I’ll be participating in a Pop-Up Art Show and Sale at a local mall, along with some other colleagues from the Oakville Art Society. And every time I look at the “To Do” list for this event, I get very, very “firsty”… for a big goblet of red wine! Nervous, yup. Excited, oh yeah. Feeling overwhelmed, uh huh. This isn’t a big show, but as my first, it’s probably a very good thing that it’s small. I’m hoping to collect as much feedback as I can, so that I may learn how to offer and present my art better, for bigger shows I’d like to participate in this spring and summer. For those of you who are veterans of the local artisan/art/craft show scene, what’s the one or two best pieces of advice you could pass along to this newbie? And if you happen to find yourself in the Greater Toronto Area on the 27th, I’d love to see you! Wow, Marion, what an opportunity for you! I would be nervous too. Its not something I have ever done. I wish you a very profitable event! Thanks much, Arja! I’m not sure what to expect, but it should be an adventure! *Go see Anna Cull, whom I follow: annacull.wordpress.com. She participates in shows regularly and may have some tips for you. I look forward to seeing one or more mini-vacation pix as SOLD in your sidebar after the event! And, I have no doubt you will travel all your life, not just this year! 🙂 Fortune, perhaps, but fame, well that is a two-edged sword. My idea of fame for you is a global reputation for excellent work. Thanks for exploring my site, snigdhadotcom, and all your encouraging comments are much appreciated! Cheers! All the best for your show..